This is an introductory leaflet to the project Delivering decentralization: slum dwellers' access to decision making for pro poor infrastructure services. This volume consists of two discussion papers that provide insights in addressing pro-poor concerns in water policy. This technical brief includes the ingredients and the process of making hand wash. This presentation describes the concept of " Green Growth"
This presentation gives an introduction to Disaster Resistant Sustainable Livelihood Framework. 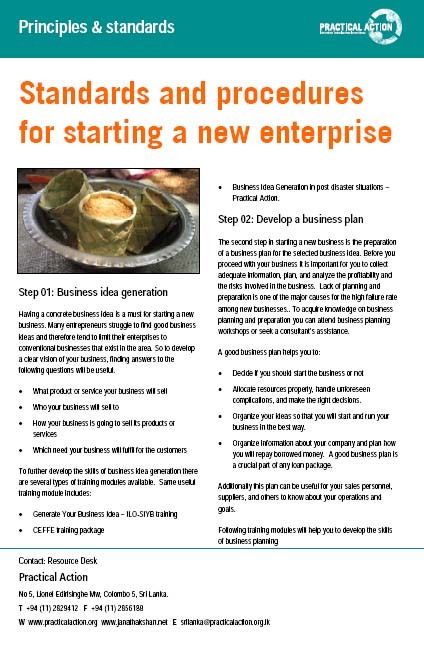 This principles and standards explains the standards and procedures for starting a new enterprise. This book offers a step-by-step guide to basic accounting and financial management techniques. The objective of this book is to provide information about entrepreneurship development programmes whose objective is to help people from the poorer groups in developing countries to create jobs for themselves by starting small enterprises. This book is concerned with the promotion of income-generating projects for refugees from poor countries, now in poor host countries, many of whom cannot return home. As aid is slowly withdrawn the need for help which encourages self-reliance is essential. This book presents practical ways to build financial management capacity in an international development context. A collection of conclusions based on case studies for small enterprises. This book looks at some of the experiences of SME projects carried out in the various countries in the region. Looks at the role of small firms and employment-generating technologies in reviving the economy. Written for those whose job it is to assist people to start their own businesses, or who are considering the merits of group as opposed to individual enterprise, this book looks at 13 case studies which all contain important lessons. The programmatic focus of the Minimum Economic Recovery Standards is on strategies and interventions designed to improve income, cash flow, asset management, and growth among crisis-affected households and enterprises. Eminent development economists tackle the question of how to design, construct and administer an economic system that will function efficiently and assure improved living standards, while respecting individual freedoms and social justice. Seven case studies from Argentina, China, Costa Rica, El Salvador, Tanzania, Peru, the Philippines and Vietnam examine how policies have been developed and implemented to encourage innovation. Neil Thin sets out to clarify the meaning of the social dimensions of development, with an emphasis on sustainability. Participatory Market System Development (PMSD) is Practical Action’s approach to inclusive markets that reduce poverty on a large scale and protect the environment. The PMSD Roadmap is a structured sequence of steps designed and maintained by Practical Action to inspire, guide and train practitioners on how to facilitate Participatory Market System Development (PMSD) on the ground. EMMA is a guidance manual for relief agencies needing to understand market-systems in disaster zones. It enables smarter use of local economic capabilities, to improve humanitarian responses.